Site Assessment | Greenjacket Inc.
Greenjacket Inc. offers unique data collection services to determine key equipment dimensions for the client. Greenjacket Inc.’s tools and patented technology allows for the components to be assessed while the equipment remains energized. Our site assessments are conducted by power linemen. The assessors wear approved and rated protective clothing, footwear, safety glasses and hard hats. The hot sticks used for the data collection have their annual testing lab stickers and testing reports are available at the time of the Site Assessment. 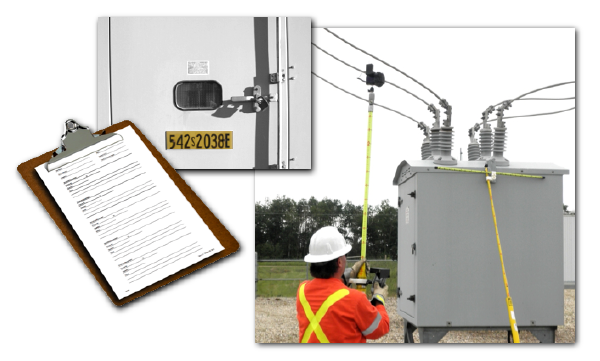 Our Site Assessors contact the substation, powerline or equipment operator contacts prior to visiting the site to determine the hours that we will have access to image the equipment. We also confirm the requirements the operating authorities have relative to protective wear for accessing the site.